That my friend Delle’s reaction when I told her of my Dad’s diagnosis. She’d been battling cancer herself for almost two years, and knew what was ahead of us. 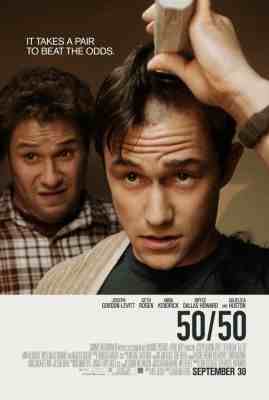 “50/50” is Will Reiser’s autobiographical film about a 27 year old man whose world is rocked by the discovery of a rare form of cancer. 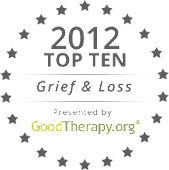 Anyone who’s been through cancer diagnosis and treatment will appreciate the truths in this film. Adam himself, vaguely restless before getting sick, now determined to maintain that everything’s okay. He insists he’s fine, even if it means keeping others at arm’s length. His mother, already caring for a husband with Alzheimer’s, is angry with the cancer and her son’s refusal of help. His girlfriend, too self-absorbed to handle the “negative energy” of his new life. His therapist, new and eager to help, who finally breaks down his walls. But mostly, it’s his best friend, Kyle, played in all his vulgarity by Seth Rogen, Reiser’s real life friend. Uncouth, immature and naturally offensive to almost everyone, he proves himself to be the best friend a guy with cancer could want. Adam’s discovery in Kyle’s bathroom, near the end of the film, is enough to make anyone cry. Every word, every scene - and some probably seem weird to those who haven’t “been there” - rings true. Kyle and Adam go out the night before Adam’s last-chance surgery. What happens will stay with you for a long time. You knew it was there all along, simmering below the surface. But seeing it unfold is remarkably powerful. Seeing “50/50” has made me re-examine how I treat friends who have cancer. Good intentions, after all, are not enough. Do I treat them with kid gloves? Do I go overboard trying to be natural? Do I talk about myself, to avoid listening to them? Do I dare to tell them I’m scared for them and I love them? I hope this movie is seem by everyone, and encourages people to offer concrete help to their friends. And I hope that it encourages people in the fight of their lives to be open to accepting the love and help of those around them.